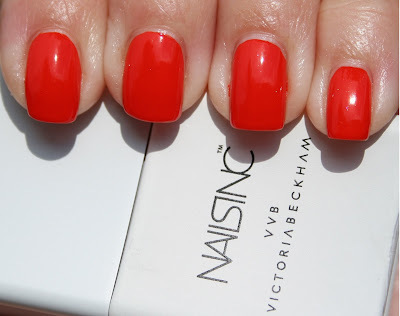 Judo Red is from the Nails Inc Victoria, Victoria Beckham for Nails Inc. Duo Collection from Sephora that I purchased a few years ago for $45. The set includeed Judo Red and Bamboo White. The individual shades were available for $25 each. Judo Red was amazing to apply- well-pigmented, it pretty much gave opaque coverage in just one coat, but I added a second to get a perfect finish. They call this a tomato red, and it actually leans a bit orange, even more than you can see in the pic. I love it! The outer rectangular part of the lid can be removed, leaving you with a regular round cap to paint with. Here's some info from Sephora.com: Created with an exclusive formulation, featuring Stretch-To-Fit technology and Bamboo Extract with Silica, this collectible set features two new polish shades: Judo Red, a vibrant tomato shade, and Bamboo White, a bone shade inspired and created to complement key pieces from the collection. 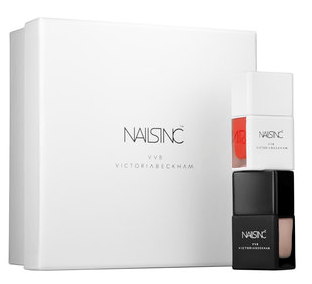 Designed by Fabien Baron and Victoria Beckham, Nails Inc’s concave glass bottled have been reinvented for the collaboration: each bottle is made with fine Venetian glass and is hand-frosted in matte black and matte white to leave a subtle reveal window on either side.